Hello my friends. Goodness, I feel like I've run an emotional marathon over the last 3 days. I got back into the pool on Friday and swam for an hour with my friend Gracie. I tried not to think of what was going on in Washington DC that day. 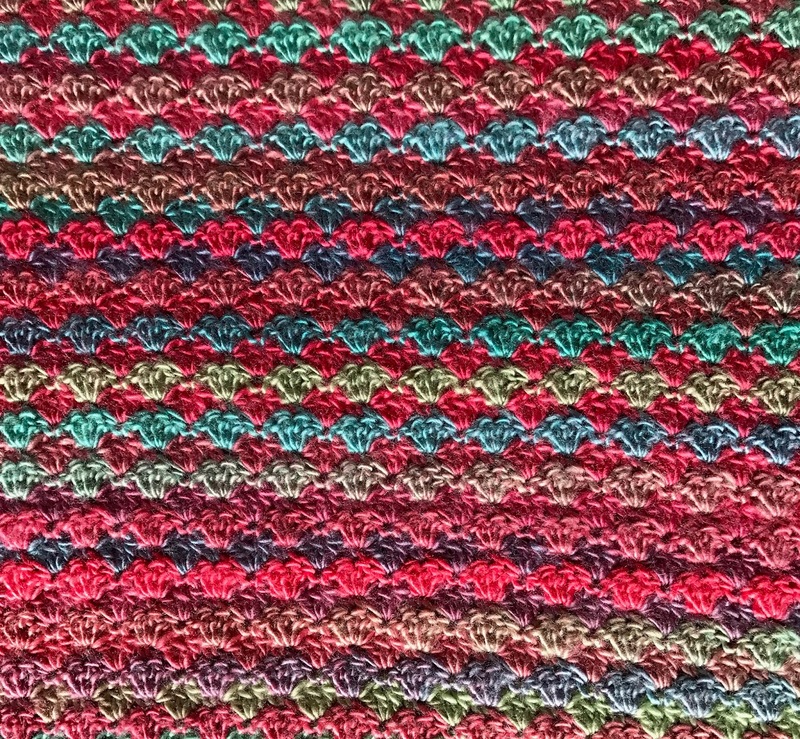 :-) Over the weekend I crocheted on the baby blanket I am doing for my nephew's baby girl and I know her two older sisters will share it with her, it's fun to know all three of them will enjoy it. And I finished! I will be mailing this soon. I love how it turned out. I made the pattern up, it's 3 double crochet shells back and forth. I began each row with a "half shell" - I'll have to write this up to share soon. I used Red Heart Boutique Unforgettable in the "Parrot" colorway. I am definitely going to make more projects using my shell stripe. Aren't the shells just cute? Now.. the Women's March. My old arthritic knees could not march for hours, but in support I knit my own hat and have been wearing it proudly wherever I go. I'm so proud of my sister Denise who walked in the Portland, Oregon march. Organizers estimate 100,000 people turned out! There were marches on every continent of the globe to a count of 2.5 million! 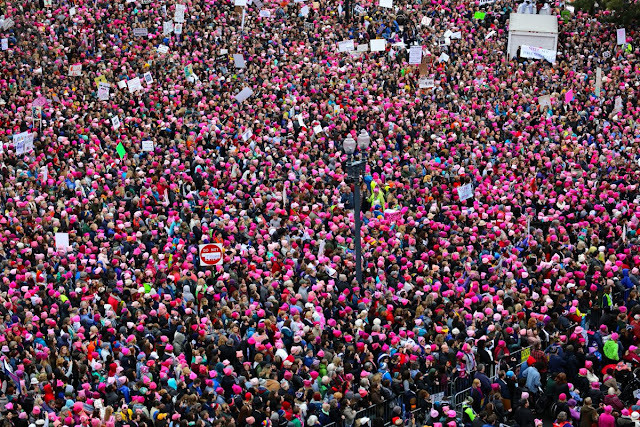 Look at the sea of pink hats in Washington DC! 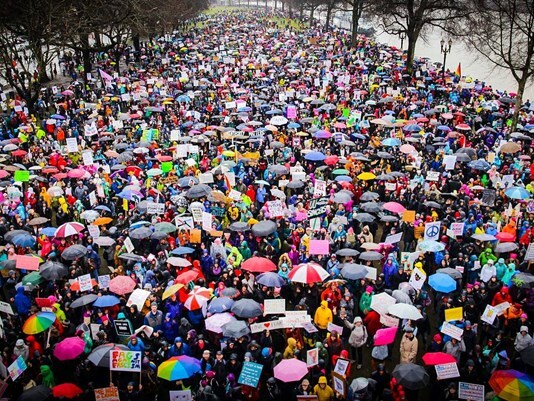 It did rain during the Portland March - I love this image of all the colorful umbrellas. My sister wore her Tilly Hat that her daughter got her for Christmas for an upcoming photo safari to Africa. She said it worked a charm. I also love this photo I found from googling march images. 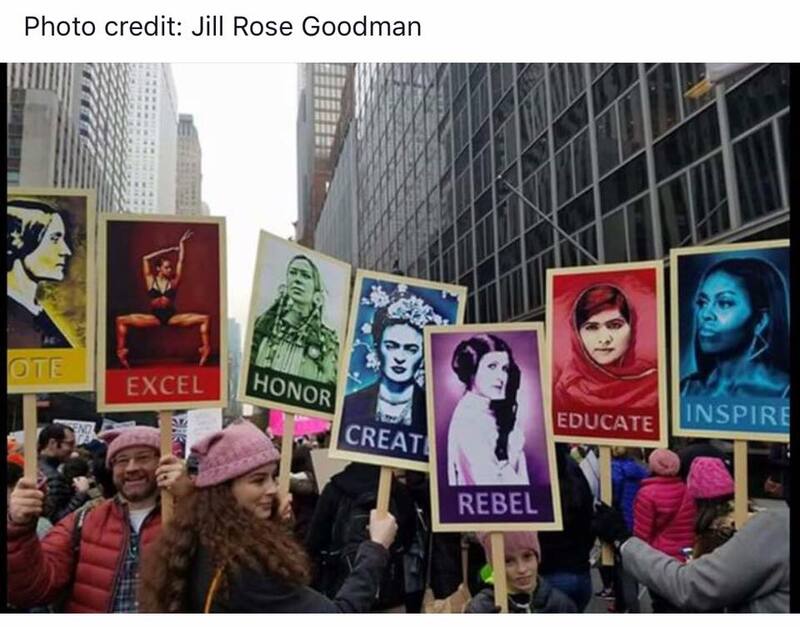 Women who inspire and are great. Love the baby blanket and how the colorway fell into a beautiful pattern. You did a gorgeous job on it and what a nice gifting for the new baby. WE must buoy each other up as we watch the shame that is going on. Your blanket is really pretty, Teresa, what a lucky baby girl! Love seeing you in the hat! I support this march and my daughter and I have had many great conversations about it. We must not lose faith my friend, then all of those politicians, that are not working for the country but for themselves will win. You look wonderful in your hat and you must keep wearing it. It is a testament to our cause. I am so proud of everyone who marched, everyone all over the world who thinks what is going on is wrong. And yes today was depressing as so much good gets whisked away. Do not bother with those that sneer at people fighting for the rights of others, these are the very people who just might be hurt the most. Or they are keeping their head in the sand not thinking it will affect them, that was not the way I was brought up. I was brought up to speak out to injustice and to help all people, not just the ones I agree with. I love your baby blanket, it will be loved. I hope they know just how special the person who made it is. I am with you all the way. Love the blanket. You did an amazing job and I'm so impressed that you designed it yourself. I finally went to the doctor today after my ice fall. He's pretty sure I have a compression fracture in my back. I had to go to the hospital for xrays and will find out tomorrow or Wednesday although I don't think they can do anything about it. Always something fun isn't it? Stay warm. Oh, yes, I'm with you! I was so heartened by the marches all over the world. The one held closest to where I live was in Los Angeles; they estimated that 750,000 people were there! And, your blanket is so beautiful, I'm sure it will keep your new little great niece cozy and warm. Sadly our news coverage on the marches has not been as comprehensive as yours, it did focus a little on a demonstration outside the American Embassy here in our capital LONDON. Love your blanket, looking forward to seeing the pattern. Your blanket is beautiful! I am sure that it will be greatly appreciated and much loved! The blanket is gorgeous, Teresa, and I know each stitch was filled with love. The last photo you shared is inspiring. It's really sickening the things that people were saying about all the women and men who marched peacefully around the world. People think they voted for change but they don't realize just how damaging it is going to be. We can not withdraw from the world as a whole. We cannot become isolated and disconnected from the international community. Capitalist cronies who are only looking after their own interests are not going to take care of anyone but themselves. I have friends in many countries around the world and they are all worried. Not a one of them thinks any of this is good. I saw someone call supporters of the marches "snowflakes" -- what does that even mean? I'm with you, absolutely! 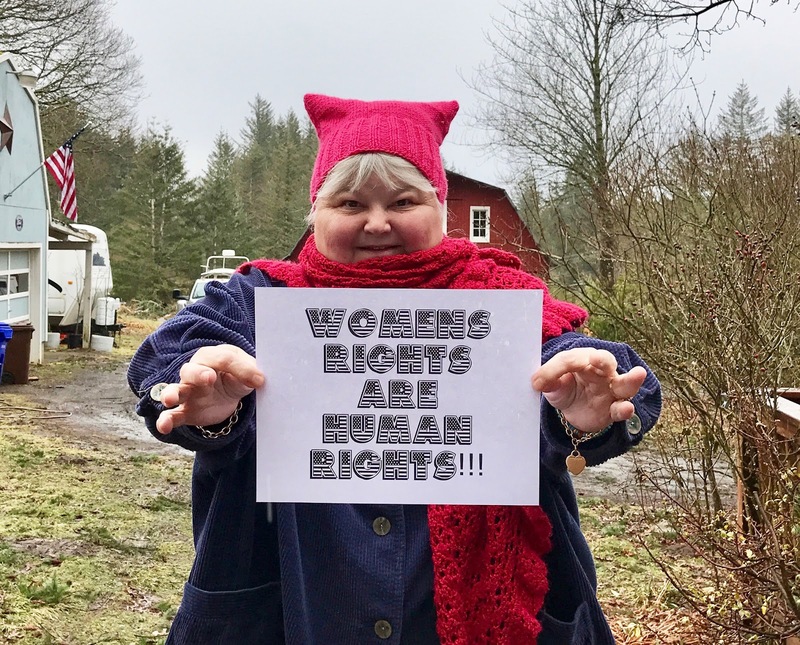 Several women In my art group marched in OR, WA, and even Hawaii while on vacation! I made a donation to Planned Parenthood in their honor since I was unable to march. 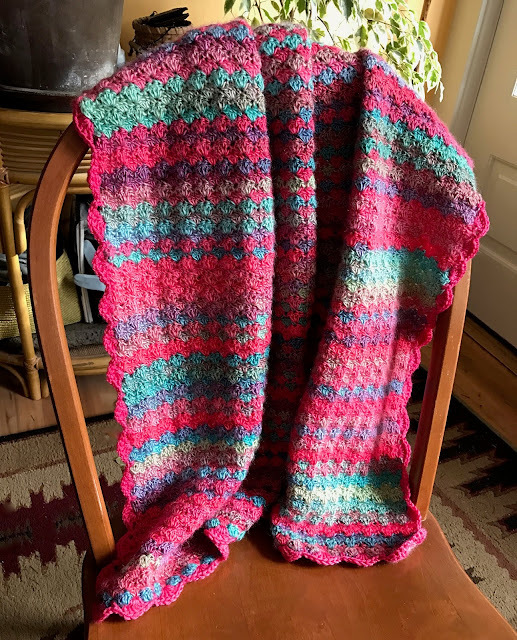 Your blanket is beautiful, love the colors and shell pattern. I used the "Unforgettable" yarn to crochet a cowl and while the softness and drape is wonderful, the yarn tangled like crazy while coming out of the skein. Grrrrr. The colors in your blanket are lovely. I almost wish I knew how to crochet but I need to keep up with my knitting...asap! I have a small project to make and will get to it this weekend for sure! Take care! You have made such a beautiful blanket! I love the pattern and how prettily the shells work with the gorgeous yarn. A wonderful gift for a baby....and sure to be treasured for years to come. Bravo to you and all the other people who participated and who stand for Human rights!!!! I was keenly watching the march on BBC World news. I felt proud of you all and to see such a massive turnout!!! Very emotive!!! 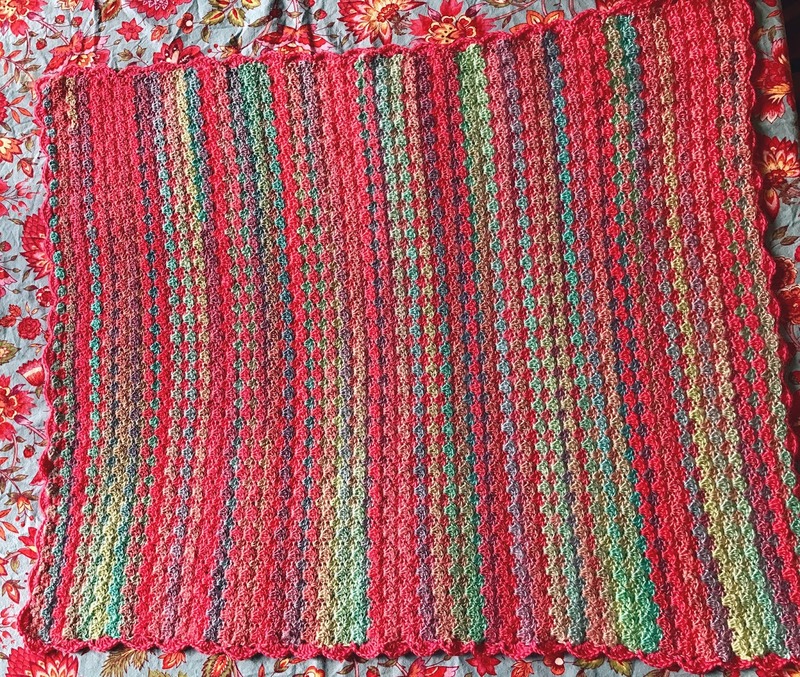 Beautiful blanket great combination of colours! I am with you Teresa. Where did those posters those marchers held come from? I'd like to get some.